Adhesion Insurance contract is a contract where one party states the provisions of the contract while the other party is not involved in its drafting, but whose participation is in either agreeing with it or declining it. 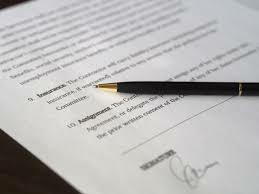 An insurance policy is known as an adhesion contract. While the rise of “e-commerce” in American (and global) society has been swift and pervasive, with online transactions coming to dominate the shopping, banking, and communication habits of consumers just about everywhere, case law has not always taken notice of this new way of doing business as consistently or quickly as the participants themselves have done. Some observers, perhaps influenced by a vaguely articulated conventional wisdom that contracts offered on a takeit-or-leave-it basis are of suspect enforceability, may be surprised by the frequency with which courts have rejected that notion and upheld the challenged agreements. In fact, the almost visceral objections prompted by the colorful “contractof-adhesion” term have rarely been borne out by cases that have truly examined the issue. Those cases have promoted a measured approach to enforcement questions, upholding the “reasonable expectations” of the weaker party as the measure of enforceability of particular terms that may overreach, without treating a lack of negotiation or a differential in negotiating power as an objection to the contract in itself. Newer decisions specific to e-commerce contracts have perhaps begun to reinforce this doctrine simply by returning to it more often than courts have had occasion to do in the past, but they have not departed from the earlier rule. The term “contract of adhesion” did not even come into use in Connecticut courts, however, until the 1980s, and its full meaning was not explicated until much later. It received its first passing mentions, with no meaningful explanations or citations to authority, by the Connecticut Supreme Court in Nationwide Ins. Co. v. Gode,17 and by the Superior Court in Pilagin v. Michalski18 and Connecticut Bank & Trust Co. v. Katske.19 As late as 1986, the Superior Court, writing in Housing Authority of the City of New Haven v. Robinson,20 still found it necessary to rely only on California law in providing a definition. Later that same year, however, the Appellate Court referred to standardized insurance policies as “contracts of adhesion” in which “[i]t is the duty of the insurance company seeking to limit the operation of its contract of insurance by special provisos or exceptions, to make such limitations in clear terms and not leave the insured in a condition to be misled.”21 And in 1988, the Connecticut Supreme Court, writing in Aetna Cas. and Surety Co. v. Murphy, began to define the term more specifically, noting that “[s]tandardized contracts of insursion contracts or provisions thereof. The first is that such a contract or provision which does not fall within the reasonable expectations of the weaker or “adhering” party will not be enforced against him. Finally, the fact that the FCT Electronics court discussed substantive unconscionability much more extensively than it discussed reasonable expectations, and its statement that Hyson and Hanks were inapplicable to the dispute before it, in part because the FCT Electronics’ parties were “sophisticated business entities,” both indicate that distinctions between supposedly sophisticated commercial parties and supposedly naïve individual consumers may remain part of the contract of adhesion deliberations in Connecticut. Under the traditional contract of adhesion doctrine, the former are entitled to the same protection of the reasonable expectations limits as are any fellow users, and the latter are not entitled by their status as consumers to any special substantive protection beyond that. It is inevitable that the expanding e-commerce world will eventually bring more detailed and more varied disputes over online contracts of adhesion to Connecticut courts. By establishing long-delayed general principles of adhesion contracts in this state’s law, FCT Electronics has provided one of the first and most important anchor points for dealing with those disputes, although significant questions still remain.